“1984” is an American television commercial which introduced the Apple Macintosh personal computer for the first time. It was conceived by Steve Hayden, Brent Thomas and Lee Clow at Chiat/Day, Venice, produced by New York production company Fairbanks Films, and directed by Ridley Scott. Anya Major performed as the unnamed heroine and David Graham as Big Brother. Its only U.S. daytime televised broadcast was on January 22, 1984 during and as part of the telecast of the third quarter of Super Bowl XVIII. Chiat/Day also ran the ad one other time on television, in December 1983 right before the 1:00 am sign-off on KMVT in Twin Falls, Idaho, so that the advertisement could be submitted to award ceremonies for that year. In addition, starting on January 17, 1984 it was screened prior to previews in movie theaters for a few weeks. It has since been seen on television commercial compilation specials, as well as in “Retro-mercials” on TV Land. The estate of George Orwell and the television rightsholder to the novel 1984 considered the commercial to be a flagrant copyright infringement, and sent a cease-and-desist letter to Apple and Chiat/Day in April 1984. The commercial was never televised as a commercial after that. 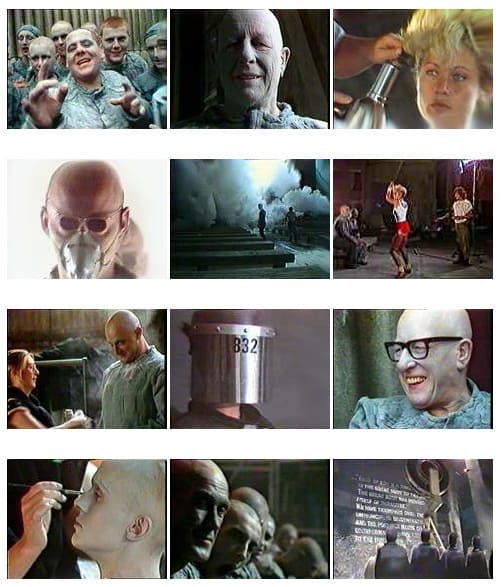 In one interpretation of the commercial, “1984” used the unnamed heroine to represent the coming of the Macintosh (indicated by her white tank top with a cubist picture of Apple’s Macintosh computer on it) as a means of saving humanity from “conformity” (Big Brother). These images were an allusion to George Orwell’s noted novel, Nineteen Eighty-Four, which described a dystopian future ruled by a televised “Big Brother”. The rows of marching minions have direct cinematic parallels with those in the opening scenes of the classic dystopian film Metropolis. The commercial was rebroadcast in an updated version in 2004 on its 20th anniversary, with the heroine modified to be listening to an iPod. Viewers generally saw the Big Brother target of the Apple advertisement as being Microsoft, with the original villain, IBM, being all but forgotten. The commercial opens with a dystopic, industrial setting in blue and gray tones, showing a line of people (of ambiguous gender) marching in unison through a long tunnel monitored by a string of telescreens. This is in sharp contrast to the full-color shots of the nameless runner (Anya Major). She looks like an Olympic track and field athlete, as she is carrying a large brass-headed hammer and is wearing an athletic “uniform” (bright orange athletic shorts, running shoes, a white tank top with a cubist picture of Apple’s Macintosh computer, a white sweat band on her left wrist, and a red one on her right). My friends, each of you is a single cell in the great body of the State. And today, that great body has purged itself of parasites. We have triumphed over the unprincipled dissemination of facts. The thugs and wreckers have been cast out. And the poisonous weeds of disinformation have been consigned to the dustbin of history. Let each and every cell rejoice! For today we celebrate the first, glorious anniversary of the Information Purification Directive! We have created, for the first time in all history, a garden of pure ideology. Where each worker may bloom secure from the pests purveying contradictory truths. Our Unification of Thoughts is more powerful a weapon than any fleet or army on earth. We are one people, with one will, one resolve, one cause. Our enemies shall talk themselves to death and we will bury them with their own confusion. We shall prevail! The runner, now close to the screen, hurls the hammer towards it, right at the moment Big Brother announces, “we shall prevail!” In a flurry of light and smoke, the screen is destroyed, shocking the people watching the screen. On January 24th, Apple Computer will introduce Macintosh. And you’ll see why 1984 won’t be like “1984. The screen fades to black as the voiceover ends, and the rainbow Apple logo appears. The commercial was created by the advertising agency Chiat/Day, Venice, with copy by Steve Hayden, art direction by Brent Thomas and creative direction by Lee Clow. Ridley Scott (whose dystopian sci-fi film, Blade Runner was released two years prior) was hired by agency producer Richard O’Neill to direct it, with a then-“unheard-of production budget of $900,000.” The actors who appeared in the commercial were paid $25 per day. Steve Jobs and John Sculley were so enthusiastic about the final product that they “…purchased one and a half minutes of ad time for the Super Bowl, annually the most-watched television program in America. In December 1983 they screened the commercial for the Apple Board of Directors. To Jobs’ and Sculley’s surprise, the entire board hated the commercial.” However, Scully himself got “cold feet” and asked Chiat/Day to sell off the two commercial spots. Despite the board’s dislike of the film, Steve Jobs continued to support it. Steve Wozniak watched it and offered to pay for half of the spot personally if the board refused to air it. Of the original ninety seconds booked, Chiat/Day managed to resell thirty seconds to another advertiser, leaving the other sixty second slot. Let’s see – an all-powerful entity blathering on about Unification of Thoughts to an army of soulless drones, only to be brought down by a plucky, Apple-esque underdog. So Big Brother, the villain from Apple’s ‘1984’ Mac ad, represented IBM, right? According to the ad’s creators, that’s not exactly the case. The original concept was to show the fight for the control of computer technology as a struggle of the few against the many, says TBWA/Chiat/Day’s Lee Clow. Apple wanted the Mac to symbolize the idea of empowerment, with the ad showcasing the Mac as a tool for combating conformity and asserting originality. What better way to do that than have a striking blonde athlete take a sledghammer to the face of that ultimate symbol of conformity, Big Brother? It is now 1984. It appears IBM wants it all. Apple is perceived to be the only hope to offer IBM a run for its money. Dealers initially welcoming IBM with open arms now fear an IBM dominated and controlled future. They are increasing and desperately turning back to Apple as the only force that can ensure their future freedom. IBM wants it all and is aiming its guns on its last obstacle to industry control, Apple. Will Big Blue dominate the entire computer industry? The entire information age? Was George Orwell right about 1984? Super Bowl viewers were overwhelmed by the startling ad. The ad garnered millions of dollars worth of free publicity, as news programs rebroadcast it that night. It was quickly hailed by many in the advertising industry as a masterwork. Advertising Age named it the 1980s Commercial of the Decade, and it continues to rank high on lists of the most influential commercials of all time […] 1984 was never broadcast again, adding to its mystique. 1984 became a signature representation of Apple computers. It was scripted as a thematic element in the 1999 docudrama, Pirates of Silicon Valley, which explores the rise of Apple and Microsoft (the film opens and closes with references to the commercial including a re-enactment of the heroine running towards the screen of Big Brother and clips of the original commercial). “1984” became a signature representation of Apple computers. It was scripted as a thematic element in the 1999 docudrama, Pirates of Silicon Valley, which explores the rise of Apple and Microsoft (the film opens and closes with references to the commercial including a re-enactment of the heroine running towards the screen of Big Brother and clips of the original commercial). The “1984” ad was also prominent in the 20th anniversary celebration of the Macintosh in 2004, as Apple reposted a new version of the ad on its website. In this updated version, an iPod, complete with signature white earbuds, was digitally added to the heroine. Attendees were given a poster showing the heroine with iPod as a commemorative gift. A commercial for the video game Half-Life 2 was based on this commercial. A parody of the commercial is seen in the Futurama episode Future Stock, promoting Planet Express. Another parody appears in The Simpsons TV show episode Mypods and Boomsticks, featuring Steve Jobs as “Big Brother” and the Comic Book Guy as the runner. For the 20th anniversary of the Macintosh, Apple re-released the ad with the runner wearing an iPod. Cellini, Adelia. “The story behind Apple’s ‘1984’ TV commercial: Big Brother at 20. (Mac Beat).” Macworld, January, 2004. Friedman, Ted “Chapter Five: Apple’s 1984.” Electric Dreams: Computers in American Culture. New York: NYU Press, 2005: 100-120. Leopold, Todd. Why 2006 isn’t like ‘1984’. CNN, February 3, 2006. Maney, Kevin. “Apple’s ‘1984’ Super Bowl commercial still stands as watershed event.” USA Today, January 28, 2004. Moriarty, Sandra. “AN INTERPRETIVE STUDY OF VISUAL CUES IN ADVERTISING,” University of Colorado. Roszak, Theodore. “Raging Against the Machine: In its ‘1984’ Commercial, Apple Suggested that its Computers Would Smash Big Brother. But Technology Gave Him More Control.” Los Angeles Times, January 28, 2004. Scott, Linda. “For the Rest of Us”: A Reader-Oriented Interpretation of Apple’s ‘1984’ Commercial.” The Journal of Popular Culture, Volume 25 Issue 1, Summer 1991: 67-81. A Look Back at Apple's Super Ad : NPR.